People, process and technology improvements drive Order-to-Cash performance but a key to continuous revenue and earnings growth is introducing a pipeline of new products in a fast, effective manner. Agile Development and Business Process Technology Alignment (BPTA) are two techniques that can help create impressive future revenues streams through strong teamwork across your company. A recent effort at a large multi-national manufacturer highlighted the strong relationship between BPTA and Agile techniques. Strong process alignment, program management and C-level support (all core BPTA tenets) allowed the development team to rush a new product to market, including “breaking a few rules” (business process rules, not regulatory or compliance items). It used the iterative hardware / software design concepts of Agile Development in product management, project management, and engineering. Agile processes can cause frustration within supply chain and manufacturing organizations due to a perceived lack of “system discipline.” Therefore, communicating the “new rules” to all stakeholders is imperative. In an Agile environment, requisitions come rapidly and still need to get into the ERP system. Even with an executive decree to “break a few rules,” there must be some constraints in the spirit of doing the right thing that do not unwittingly create more problems than the expedited schedule avoids. ALL support organizations must be actively engaged in these aggressive projects to understand the reasons for it and expected responses. 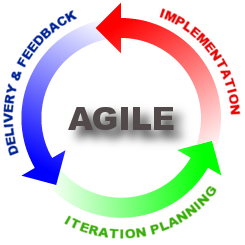 Agile techniques knowingly create iterations, and potential confusion, so communicating expectations and results to all affected functions helps everyone understand and deal with short turnaround needs. Project teams can “freeze” the longer lead-time parts earlier in the design cycle and minimize impacts to the overall project cycle-time. Early engagement of teams, ERP system and business process reviews can provide rapid reaction to unforecasted items. ERP systems have the necessary capability for streamlined manual requisitions to support Agile Development. Your company should review your business processes and modify them to meet your needs for accelerated projects. By streamlining development cycles through Agile and BPTA methods, you can achieve greater impacts on your Order-to-Cash performance. Speed and Staying Power: Are you ready to be your competitor’s worst nightmare?